One of the harbingers of very early spring for me has been the cautiously optimistic amphibians awakening from a long winter's sleep. 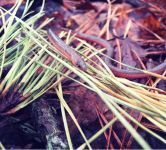 The chorus frogs and tiny spring peepers are making a glorious racket and I am now ever more careful when driving near wetlands, always on the lookout on rainy nights for street-crossing salamanders and frogs in search of their spring nesting sites. Although April is proving so far to be colder than some days this past December, there is a lot of bustling activity. 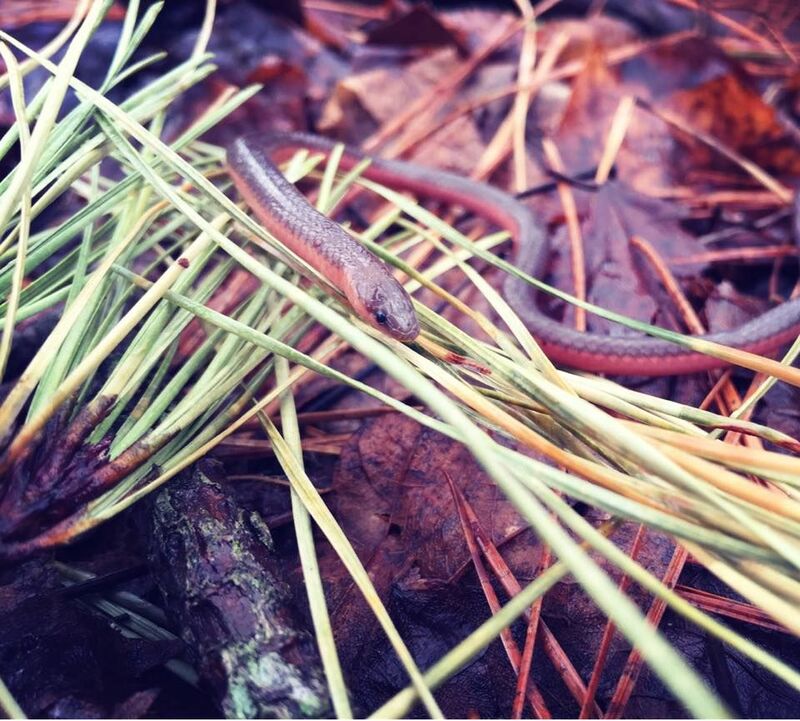 A couple of weeks ago, I was delighted to happen upon a small Eastern worm snake crossing in front of me on the sun-warmed leaves and pine needles on one of our trails. Seeing this little individual was an unusual and unexpected sight because they are burrowers by nature and are rarely seen above ground. Notice the pointed, shovel-like nose that makes it a perfect adaptation for digging into the soft earth (you will need to click on the photo in order to see more details). 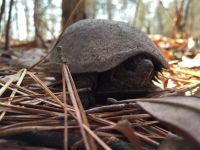 Days later, a small Eastern mud turtle was sitting pacifically next to a trail adjacent one of the wetlands on the Refuge. 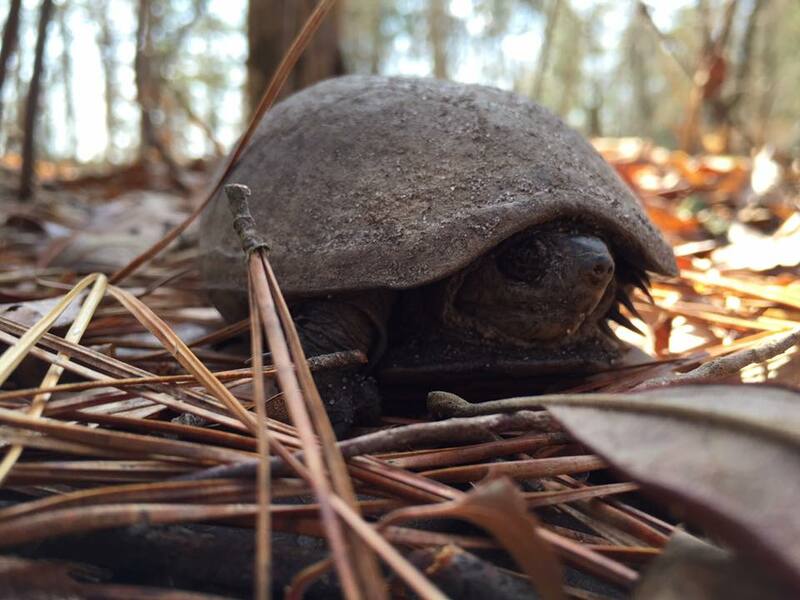 Endangered in two states due to wetlands habitat loss, the mud turtle occasionally will dig burrows into the ground for a period of rest known as aestivation in warmer, drier months or true hibernation in the winter. This little individual might have just emerged from a wintertime burrow  she is still covered in coarse sand (click the photo for a larger view). 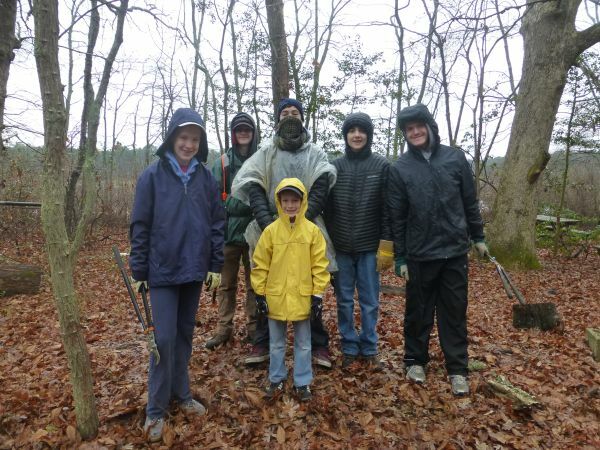 We reported that local Boy Scout Troop 8 of Cherry Hill, NJ, had done some truly great work on one of the hiking trails this winter. The family and friends of Eagle Scout candidate Zachary Bornyasz worked diligently to carefully clear a major trail, paying close attention to Refuge guidelines to only clear as much as is necessary for easy passage. They were kind enough to share some of the photos from that long day, including this one (click on the photo for a larger view). We are happy to report that Zach achieved the rank of Eagle Scout as a result of his Joe's Trail project. Congratulations Zach! We had a fantastic day at the event for local artisans, "Lines on the Pines" on March 13. The coordinator was very excited to have us there, sharing information about the wildlife at the Refuge, but also showing, for the first time in about two decades, prints of paintings by co-founder Hope Sawyer Buyukmihci. The work received a lot of positive response and we look forward to more events this summer. 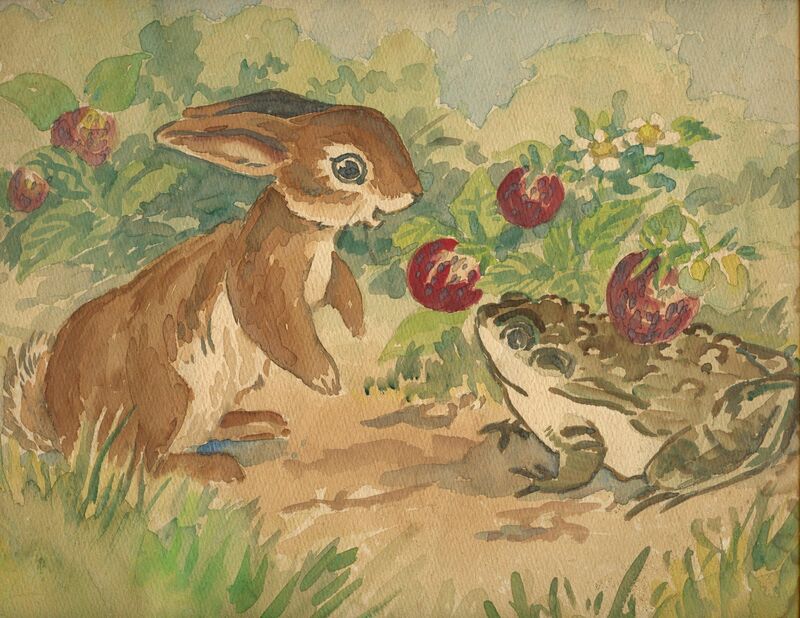 One of the prints, a lovely watercolor of a rabbit and toad, is shown here (click on the image for a larger view). Buena Vista Township reached out to us this month to join them at the Richland Village Festival on May 21. We will also be showing Hope's work there and talking to some local residents about preservation and about appreciating New Jersey's unique habitats and wildlife. 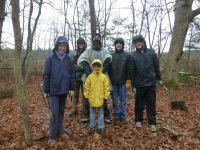 More than 20 dedicated volunteers joined us on April 23 and 24 for Earth Day weekend work. 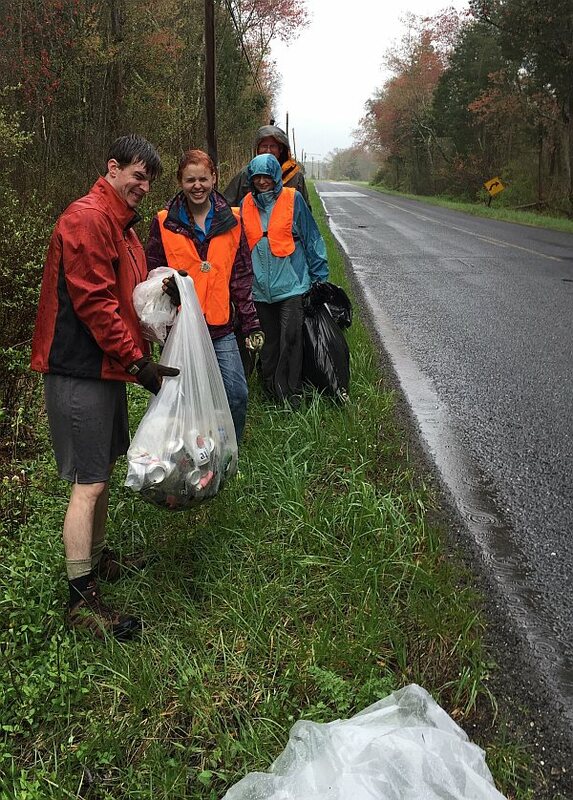 On Saturday, a dozen of us armed with trash bags and bags for recycling, cleaned up all the trash from both sides of a miles-long stretch of road adjacent the Refuge. Afterwards, we all gathered back at headquarters, grilled vegetable kebabs and enjoyed a rainy, warm afternoon under cover of trees or in the makeshift dining hall we created in one of our outbuildings. On Sunday, the Outdoor Club of South Jersey joined us to do some trail maintenance and revitalize some of our trail signs. A sincere and heartfelt thanks to all these wonderful people! Please remember Unexpected Wildlife Refuge when planning your will and estate. It is an easy, effective and lasting way to help the Refuge... and wildlife. When talking with your estate planner, just provide them with our name, address and tax identification number (23-7025010). This is one of the most important gifts the Refuge can receive. If you have already included us in your future plans, thank you!